Twenty-eight days have come and gone, and the moment that KZN has been anticipating has arrived. Who was the lucky winner of the R30,000? Darren Maule left the studio in the hands of Keri and Sky whilst he went out searching for the location of the winner. He kept everything a secret until the last moment, and it was worth it! Along the way, Darren did make a pit stop to refuel - his tummy of course. Once that was done, he was on his way. Relying solely on the navigator to direct him, he knew the listeners' suspense was growing. He continued to do live crossings with Keri and Sky to keep KZN updated. Dropping little hints of where he could be, Darren definitely had KZN hooked. After much travelling and a few wrong turns, Darren arrived at the location. Darren met with our winner's manager, who snuck him inside the company. 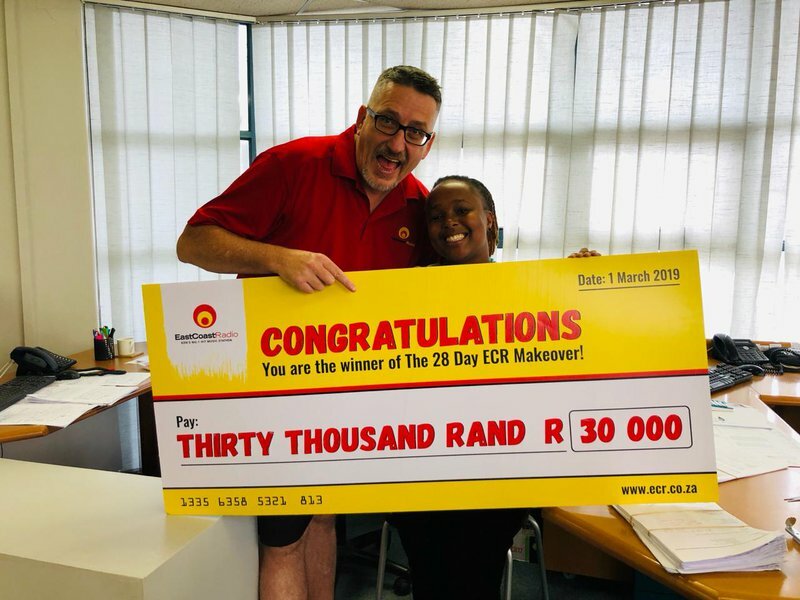 The moment arrived, Nondumiso was not expecting Darren Maule to be at her work with a R30,000 cheque. Her reaction was priceless, which made every moment worth it. "With my money I'm going to pay off my student debt and buy my granny a bed," she said. With a heart like hers, she definitely deserved it!